All Alert Notifications are sent to the Administrator's Email Address. So if you are not receiving Notifications after setting them, please contact support@freshops.com.au and ask which email is the Administrator Address and we can change accordingly. A Late Shift Notification provides the Employee who is Late, how many minutes they are late by, which depends on the rule you setting in the Notifications Settings i.e. If you have it set to Alert me at 10min, you will receive this Notification 10min after they were due and it'll always say that they are 10minutes late at time of delivery. 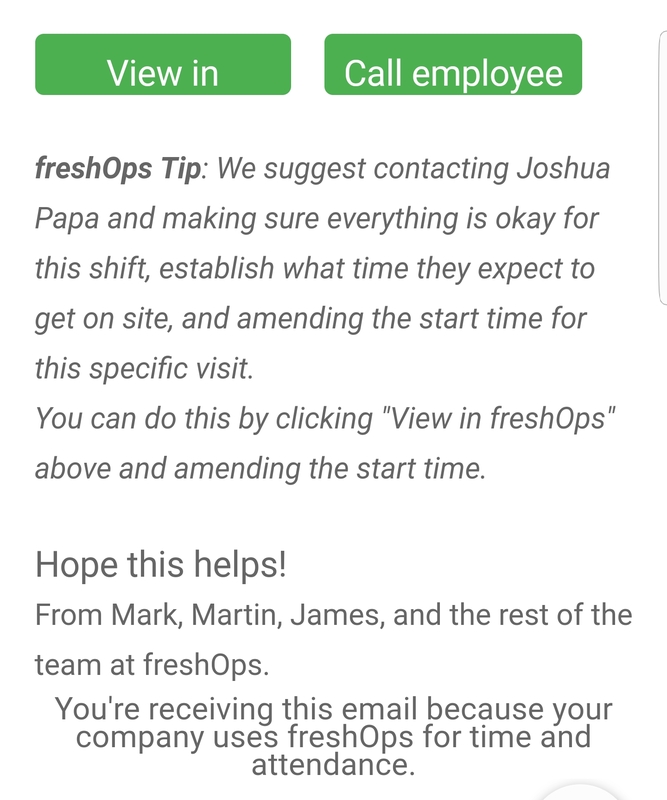 You can click "View in freshOps" from your Computer or Tablet which will launch this specific Job into freshOps. NOTE: You may be required to Login into freshOps, if you haven't accessed freshOps from that device. All our Alerts include a freshOps tip. This is meant as a guideline to provide you with the context in how to action this particular alert and also highlight the benefit of this feature for you. An Over-Run Notification provides the Employee who has spent more time on site than scheduled, which site it is, their actual check-in time and therefore based on the scheduled times when they were expected to check-out. If you have it set to Alert me at 10min, you will receive this Notification 10min after they were due to check-out. Alerts are generated at the specified time in your Notifications settings. If you don't action these Alerts immediately, remember that when you click VIEW IN FRESHOPS that the job Status may have changed i.e. the Cleaner may have started since the Notification was generated, or may have checked out. However, if after viewing in freshOps the status of the job is still LATE or IN PROGRESS you can except the Notification as still being relevant. To make contacting your Employee or Contractor quicker, you can also Click the "Call employee"Button from a Mobile device to get in touch with your cleaner quicker.